cityofsound: Essay: On the "Archigram-What-Organisation-You-Must-Be-Joking-Mate"
Ben Terrett asked me to jot down some thoughts on the way Archigram worked, as part of a piece he’s pulled together on them, Pentagram and Magnum (the other pieces written by Michael Bierut and Henrietta Thompson, so I’m in august company). The idea being that all these organisations were united in having interesting 'co-operative' structures that enabled creativity. (As well as all ending in ‘m’). So here’s my quick and glossy contribution, on how I understand Archigram’s organisation to have contributed to their creative success. The bare facts are these. Six youngish men come together in various flats in Hampstead, London, in the early 1960s. They produce a magazine-like publication Archigram, that lasted from 1961 to 1970 (roughly), and the firm that had grown out of it, Archigram Architects, lasts until 1975. 900 drawings are produced along the way, yet assessed In terms of built projects they produce only a playground in Milton Keynes and a swimming pool for Rod Stewart. If that. And yet they influence architecture profoundly. Their work is the thing, and should be pored over time and time again (see refs. below), but the question here is whether their organisational structure aided this extraordinary state of affairs. Secondly, the key point of difference is that they heavily influenced without making buildings. Could a band influence as much without releasing a record? In this, they were part of a tradition of un-built but visionary work that makes architecture and urbanism almost unique in design practice. So what set them apart was the publishing. That espoused a take on modernism informed by a generally positive reaction to the technology and media that had which emerged, with necessary inventiveness, from WWII, a conflict that was still front of most people's minds, self-evident in the shattered cities around them. This optimism and invention is then allied to the 'post-scarcity' culture that emerges in the late-’50s, as they cut and paste the space race onto colour telly and pop-art and planned obsolescence, spray-painting structural engineering with beat poetry and Harold Wilson's 'white heat of technology', fusing Monty Python montage into avant-garde internationalist happenings in, wait for it, Folkestone. In pursuing the unbuilt, ephemeral, temporary and informational, they are precursors for a version of the 21st century (at least the one unaffected by peak oil). Their proposals for Instant, Walking or Plug-In Cities, Suitaloons and Living Pods, were radical, fluid, malleable, intimate and transient—"tune up, clip on, plug in" into "rooms (that) expand infinitely. Our walls dissolve into impermeable mists or into the imagery of stories and fables ...". Yet their own structure remained relatively solid. If not the band, the architectural practice was essentially their recognisable model, though that is usually just as rife with splits, egos, and partners flouncing out over non-musical differences. There seems to have been little of that in Archigram's dissolution. Only that a large scheme in Monte Carlo fell through, and their fabric couldn't stretch over the distance from Folkestone to Los Angeles, which is a long way geographically but even further culturally. So there's a disparity between their projects—"an architecture that twitched ... was responsive to people" - and their own structure. Certainly, it seems to have been fairly disorganised. 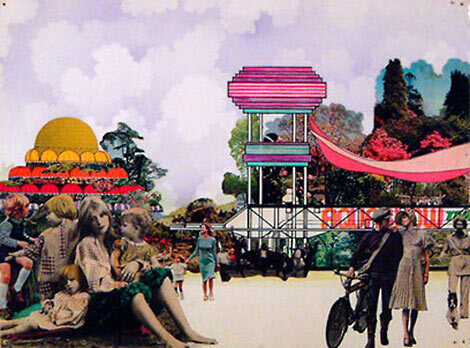 Reyner Banham called them, the "Archigram-What-Organisation-You-Must-Be-Joking-Mate". But no more so than for many other architects. "I was the enthusiast. Mike Webb was the genius. Ron [Herron] was the fantastically fluent member. Warren [Chalk] was the warrior. David [Greene] the poet. Dennis [Crompton] was the technologist. And I was the beaver, the operational person. Everybody overlaps, but that’s the simplified version." The fact they were rarely troubled by building things for clients may have enabled the six-person team to remain six - to attempt to realise much of what they proposed would have inevitably meant a certain fraying at the edges, as such highly complex work now tends to involve numerous specialists. Plus of course that messy necessity of clients. Firms actually approaching their ideas in built form these days—arguably OMA/AMO, Arup, MVRDV, Foster, Rogers, Herzog + De Meuron, Future Systems, Morphosis, and Atelier Bow Wow perhaps—are larger or highly diverse, sometimes corporate and very collaborative structures. But as an ideas generator, this 6-person team of occasionally spiky, overlapping semi-specialists, unified by a single trade, medium and sensibility, was immensely productive. Given that medium was publishing, and their trade ideas, it was also immensely flexible. They took to heart the maxim, perhaps after Cedric Price, that "when you are looking for a solution to what you have been told is an architectural problem—remember, the solution may not be a building." Cook, the most vocal member today, is slippery on who was actually in the office, doing what. But also notes that the "untidy structure", as he called it, meant they've never really stopped as well. As they transcend a firm and become more of a genre, they become less of an organisation and more of an idea. If we can get that fluid with things, a key part of their organisation not often articulated might be the umbrella. In a sense, they were part of an un-named and equally loosely-aligned multidisciplinary movement, with Cedric Price, Eduardo Paolozzi, Richard Hamilton, James Stirling, Buckminster Fuller, Reyner Banham and The Smithsons hovering over the group as some kind of unlikely beneficent chorus. Other firms or movements, such as Italy's Superstudio, Japan's Metabolists, fore-runners Team X, are also part of this scene. In this, a fluid membrane of intellect surrounded the group, through which ideas could be tested, progressed, translated or deleted. A jellyfish-like structure comes to mind, a translucent, flexible dome of thinking, floating over a smallish core body. This was not a formal organisation at all—barely even a movement, just partly-shared sensibilities - but enabled a rich loam for fertilising ideas, and created a purpose and direction for the work. It's difficult to see equivalents today. Might this layered umbrella structure be the important factor? They might have called it the 'organisation gloop'. Cook asserts "the strength of Archigram was surely its layers of inconsistent parts, keeping going a continual fascination with each other. " So within the gloop, this fascination holds the core. It's almost no more than a sudden freeze-frame on a longer timeline, a group of people coalescing around a way of thinking, as much as doing. They were a purely informational organisation, as close to media, marketing, branding, banking or academia as to architecture, as was their work. So perhaps the essence to extract from Archigram's organisation was not in their own structure, but in the structure of the buildings they proposed - an organisation that twitches, is responsive to people; an organisation that coalesces, exists briefly, and then is gone, existing only in time; organisations that can expand infinitely, or dissolve into stories and fables; organisations in which the function can switch fluidly; organisations with a permeable skin ... Really, you could take Archigram's work and find and replace the words 'built environment' or 'architecture' or 'city' with the word 'organisation', and that would give you a truly innovative structure indeed.